Just the title of this blog post will have some people exclaiming "Yuck!" I absolutely love Brussels sprouts, but there are plenty of people out there who just as passionately hate them. I would argue that a lot of these haters have never eaten a properly prepared Brussels sprout. It makes a huge difference! In my opinion, one step in turning that "Yuck!" to "Yum!" is to grow your own Brussels sprouts or buy the freshest ones you can find at your local Farmer's Market or grocery store. Brussels sprouts are one of my favorite crops to grow in my home garden because they really need a minimum of care. 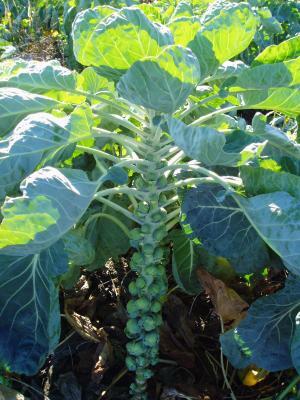 Brussels sprouts are typically planted as seedlings anywhere from very early spring to mid-summer. They are related to cabbage, broccoli, and cauliflower and can survive light frost without issue. Brussels sprouts need ample water during the heat of summer, and may need some form of insect control, especially if cabbage worms have been a problem in your garden. These pests do not just attack cabbage, but they enjoy feeding on any cabbage relatives, including Brussels sprouts. Some very early varieties of Brussels sprouts bred to be heat-tolerant may be harvested during the summer months. But without adequate water, even these reportedly heat-tolerant varieties will have a tendency to form really loose heads and taste bitter. Who knows, maybe some of the Brussels sprouts haters out there formed their opinions thanks to some bitter summer-harvested sprouts. Many gardeners find that planning for a fall harvest of Brussels sprouts is a much tastier route. Fall-harvested sprouts may be planted as late as midsummer. I personally plant my Brussels sprouts in the spring and just let them grow all summer long. In my experience, they really only start to produce any sort of heads in the fall. 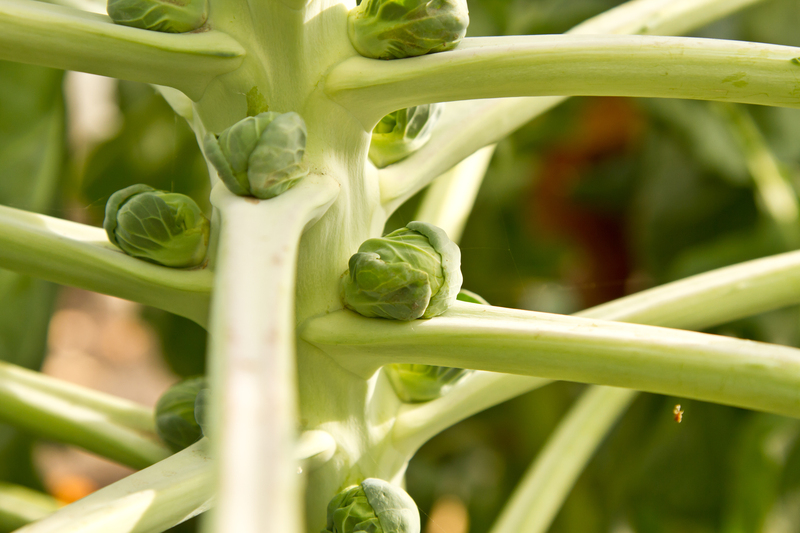 Light frost promotes the release of natural sugars, giving the sprouts a subtle sweetness. If you've never seen how Brussels sprouts grow, you might be surprised to see that they grow sideways from a central stalk, one sprout at the base of each leaf extending from the stalk. Some growers remove some of these leaves to promote growth of the sprouts but it is not really necessary. The sprouts mature from the bottom up, and can be removed a few at a time or the entire stalk may be cut down and harvested. I can't tell you how many people I've encountered that are completely surprised to see how Brussels sprouts grow. Many people thought they grew like tiny cabbages, all in neat little rows in the garden! In picking the brains of Brussels sprouts haters, to try and pinpoint what they don't like about them, most will describe being served Brussels sprouts boiled within an inch of their life, reduced to an olive green pile of mush. This way of cooking Brussels sprouts releases sulfur containing compounds which smell and taste bad as well. No wonder they think they hate them if this is the only way they've tried to eat them! Clean fresh Brussels sprouts, removing any yellow leaves, and trimming stems if needed. Cut large sprouts in half. Blanch sprouts by putting them in boiling water for 3-4 minutes. Remove from boiling water and plunge them into ice water to cease all cooking. Sprouts should be bright green and slightly tender. Heat olive oil in a skillet on medium-high. Add sprouts and garlic if desired. Stir frequently and cook for 8-10 minutes or until sprouts begin to caramelize and appear brown on the edges. The caramelizing brings out their sweetness. Stir in your favorite nuts-- two of my favorites are pistachios or cashews. Add a squeeze of lemon juice, salt and pepper to taste and serve!